Vino Nobile di Montepulciano does indeed have a noble and storied heritage. The wine is named after the ancient and scenic hill-top town of Montepulciano whose soaring Renaissance architecture enlivens the landscape of southeastern Tuscany. These wines have been admired for centuries and were held in such high regard that they were reputedly reserved for the tables of Tuscan nobility, hence, the term “Nobile” (or “noble” in English) included in the name. Their lofty reputation was not limited to just Tuscany as our own President Thomas Jefferson was a big fan of Vino Nobile wines. 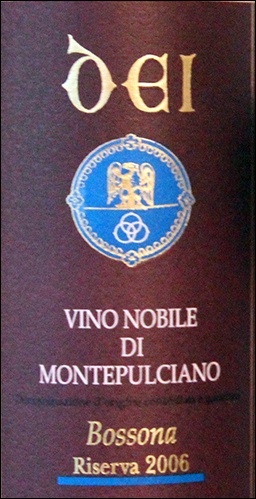 Vino Nobile di Montepulciano was also one of the earliest recipients of Italy’s DOCG designation. But due to complacency and a touch of hubris on the part of producers the quality and the reputation of Vino Nobile wines suffered and fell out of favor in the 1960’s and 70’s. This was about the same period when the formerly unheralded wines from neighboring Chianti and Brunello vintners gained in stature and price. But things began to change in the Montepulciano vineyards in the 1980’s as a new generation of dedicated, quality-oriented producers began upgrading facilities and improving vineyard management and cellaring processes with an eye to burnishing their once grand reputation. These quality-driven initiatives by traditional producers were bolstered by an influx of non-Tuscan producers with deep financial pockets that further spurred competition and gave new impetus to producing more interesting and praise-worthy wines. By the early 1990’s the Montepulciano wine scene was in full renaissance bloom as word gradually spread about the new, rejuvenated Vino Nobile wines. While Vino Nobile wines are dramatically improved from where they were in the 1950's and 60's, they are still a work in progress as producers continue to experiment with different blends and vinification and aging regimens. There is no standard profile today for Vino Nobile di Montepulciano wines. Vino Nobile wines can be lean and structured with firm tannins or rich and plummy with soft tannins or anything in between. The primary grape used in Vino Nobile is a sub-varietal of Sangiovese known locally as Prugnolo Gentile. This is the same Sangiovese variety used exclusively in the famed Brunello di Montalcino as well as the primary varietal for Chianti and many Super-Tuscan wines. Regulations for Vino Nobile di Montepulciano require that they must be at least 70 percent Sangiovese with up to 30 percent other indigenous red varietals such as the textured Canaiolo or the fragrant Mammolo as well as some “international” varieties such as Merlot and Cabernet Sauvignon. If anything, there is a trend towards greater reliance on Sangiovese and some premier Vino Nobile wines today are made entirely of Sangiovese. The regulations also specify that Vino Nobile wines must be aged for a minimum of 24 months of which at least half this period must be spent in oak barrels, either large casks (called botti) or small barrels (called barriques) or a combination of both. Vino Nobile wines labeled Riserva must be aged for at least 36 months of which a minimum of 18 months must be spent in oak barrels. Vino Nobile typically has a garnet-red color that gradually acquires a brick-red tint as it matures. It will generally have a lively acidity, moderate alcohol level and a pleasant tannic finish due to cautious use of oak in the aging protocol. Consequently, these are food-friendly wines that will grace most any table especially if the menu includes red meats, roasted white meats, game or aged cheeses. They are also long-lived wines that if stored under proper conditions will age gracefully for 10 to 20 years after vintage. Vino Nobile wines are also surprisingly affordable. They lack the lofty reputations of near-by Brunello and Super-Tuscan wines and Vino Nobile prices have not kept pace with the dramatic improvements in quality of recent years. The bottom line is that Vino Nobile wines are generally less expensive than other Tuscan wines of similar quality and may well be the best value in Tuscan wines today. Listed below are a half-dozen or so well-made and engaging Vino Nobile di Montepulciano wines. They are widely available and can be found in almost any well-stocked Italian wine shop in the U.S. The wines are listed alphabetically by producer. Avignonesi is probably the most recognized and storied Vino Nobile producer. Their wines are also widely distributed in the U.S. The 2010 Vino Nobile is made entirely of Sangiovese sourced from two of the estate’s vineyards. After fermentation the wine is aged in oak for 18 months (80 percent in second-year barriques and the remainder in botti) and spends an additional 6 months in the bottle prior to release. With its enticing aromas, rich dark fruit flavors, good acidity and gently tannic finish it is a classic expression of Vino Nobile and was included in Wine Spectator’s top 100 wines of 2013 (#58). Boscarelli produces a number of different Vino Nobile wines priced from about $20 to over $80, all of them good. This single-vineyard bottling from the great 2006 vintage is especially worth seeking out. The Vigna del Nocio consists of 80% Sangiovese, 15% Merlot and 5% Mammolo, all grown on the estate’s Nocio vineyard. The wine is aged for 2 years in large oak casks followed by another 3 to 6 months in the bottle. This is a benchmark Vino Nobile that typifies the renaissance in the appellation - intense and structured with intoxicating fragrances and fruit flavors. This is another great - but less expensive - effort by the Boscarelli winery. This wine is 85 percent Sangiovese and the rest a combination of other local red varieties. After fermentation the wine is aged in a mix of large and small oak casks for 2 years. The result is a stylish and elegant wine with a medium-weight body, captivating black fruit flavors and silky tannins. Although the Dei family has been growing grapes on their property since 1964 it wasn’t until twenty years later that they bottled the first edition of their own Vino Nobile di Montepulciano. Under the direction of the current manager, Caterina Dei, the estate’s complex and elegant wines have been pacesetters in the renaissance of Vino Nobile wines. Their wines also have the benefit of being very reasonably priced for wines of this quality. The estate’s “Bossona” Vino Nobile di Montepulciano Riserva is one of the best expressions of Vino Nobile. This single-vineyard wine is comprised entirely of Sangiovese grapes that undergo a relatively long fermentation (almost a month) before being racked off to age in large oak casks for 3 years. The wine then spends an additional year in the bottle before release for sale. Its dark fruit flavors and captivating fragrances are sure to please. It is full-bodied and intense and a great example of what a quality-driven Vino Nobile is all about. The 2006 vintage was an excellent year for Vino Nobile and this Dei Bossona will age well for 8 to 10 more years. In an area dominated by small to medium-size, family owned and operated wineries, the Fattoria del Cerro operation is an anomaly. It is part of the Saiagricola organization, an agricultural holding company with a portfolio of prestigious wineries throughout central Italy and its extensive vineyard holdings make it one of the largest wineries in the Montepulciano area. The winery has an extensive lineup of Vino Nobile as well as Chianti and Super-Tuscan wines. The estate’s 2010 Vino Nobile is a blend of 90 percent Sangiovese and 10 percent other local red varieties. After fermentation the wine is aged for 18 months in a combination of large and small oak casks followed by an additional 6 months in the bottle. It is a relatively inexpensive but charming Vino Nobile with dark fruit flavors and a lively intensity. The La Braccesca estate in Monteplciano is a part of Antinori’s expansive wine empire. La Braccesca has significant vineyard propertie s in some of the most prized areas in the Vino Nobile di Montepulciano DOCG. The estate’s 2008 Vino Nobile is a blend of 90 percent Sangiovese and 10 percent Merlot. After fermentation the wine is aged primarily in large oak casks with a small portion aged in small oak barriques for 14 months. The wine receives an additional twelve months of bottle aging before release for sale. It’s a big, rich and polished wine. Wines from Antinori’s extensive Tuscan portfolio seldom disappoint and this one is no exception. 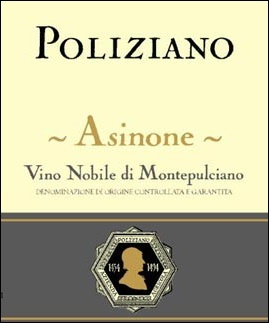 The Poliziano winery produces several different wines but its single-vineyardVino Nobile di Montepulciano Asinone is the estate’s flagship wine. Unlike many other Vino Nobile wines that are blends of several grape varieties, this wine is made entirely with Sangiovese. The grapes are harvested in late September or early October and several passes of the vines are made in the process of hand selecting the best quality grapes. After fermentation in stainless steel vats the wine is racked off and aged for 16 to 18 months in French oak barriques. It is an elegant wine with silky, rich dark fruit flavors that envelop and caress your taste buds and make for a decadent drinking experience. The estate’s Vino Nobile Asinone is a serial recipient of Gambero Rosso’s prestigious Tre Bicchieri award. The Asinone is produced only in the best years and in other years the grapes that would normally be used for Asinone are allocated to the estate’s basic Vino Nobile di Montepulciano.